Goals from Carlos Tenorio and Agustin Delgado proved enough to give Ecuador a deserved victory over World Cup Group A rivals Poland in Gelsenkirchen. Tenorio nodded past Poland keeper Artur Boruc after connecting with a headed flick-on from Delgado. Delgado tapped in the second after Ivan Kaviedes sprung the offside trap to lay the ball into his path. Poland came closest when Ireneusz Jelen and Pawel Brozek hit the woodwork with fierce shots in the second half. The result is a massive boost for Ecuador and their chances of taking second spot in Group A. And from this performance they may even give Germany something to think about when the pair meet in the final group match on Tuesday 20 June. Apart from a few nervy moments courtesy of Christian Mora's eccentric keeping, the South American side looked solid at the back, in particular captain Ivan Hurtado, and rarely let the roving pair of Ebi Smolarek and Celtic's Maciej Zurawski have a look in on goal. Poland did most of the pressing in the opening 20 minutes, but a high and wild free-kick from Jacek Krzynowek and an equally inaccurate Zurawski 20-yard shot were all they had to show for their efforts. Ecuador looked nervous during the first exchanges, but Tenorio's header midway through the first half changed the team's mood. The striker outjumped the Poland defence to connect with Delgado's flick-on and head past the outstretched right hand of Boruc. Another long throw nearly caught out Pawel Janas' men again, but Delgado blazed Tenorio's pull-back, following a jinking run, over the Poland bar. Shortly before half-time Ulises De La Cruz walked through a static defence, but saw his shot turned away for a corner. Edison Mendez then forced Boruc into making a smart save from a 30-yard free-kick, before Luis Valencia also tried his luck from long range only to find the Poland keeper alert once again. Poland increased the tempo in the second half, but found Hurtado and his backline troops in valiant form, obstructing every ball that came in from the flanks. The woodwork also came to the rescue of the Ecuadorians on two occasions - first when Jelen struck the crossbar from a tight angle before Brozek's fierce effort rebounded off the right-hand upright. But with 10 minutes to go, and against the run of play, Ecuador sealed all three points when substitute Kaviedes beat the offside trap to set up Delgado who scored from four yards out. Poland: Boruc, Jop, Baszczynski, Bak, Zewlakow, Sobolewski (Jelen 67), Krzynowek (Kosowski 77), Szymkowiak, Smolarek, Radomski, Zurawski (Brozek 84). Subs Not Used: Bosacki, Dudka, Fabianski, Gancarczyk, Giza, Kuszczak, Lewandowski, Mila, Rasiak. Ecuador: Mora, De la Cruz, Hurtado (Guagua 69), Espinoza, Reasco, Mendez, Castillo, Valencia, Edwin Tenorio, Delgado (Urrutia 83), Carlos Tenorio (Kaviedes 65). Subs Not Used: Ambrossi, Ayovi, Benitez, Borja, Lanza, Lara, Perlaza, Saritama, Villafuerte. Goals: Carlos Tenorio 24, Delgado 80. Fifa man of the match: Agustin Delgado. Coach Pawel Janas fielded the oldest Polish starting line-up ever at a World Cup match for this game. The Poles have now failed to score in their opening match at the last five World Cups they have qualified for. The last time Poland scored in their opening match was at the 1974 World Cup when they beat Argentina 3-2. 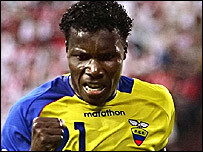 This 2-0 win over Poland is Ecuador's biggest ever World Cup victory. Their only previous triumph came in the last group match at the 2002 World Cup against Croatia (1-0). Carlos Tenorio became only the third Ecuador player to score a World Cup goal, joining Agustin Delgado and Edison Mendez. Delgado became sole top scorer for his country netting his second World Cup goal. Delgado's first World Cup goal came four years ago in Ecuador's 2-1 loss to Mexico.